Photograph of project models for Accordion Fold Print; (top) Current journal book 130, open to one set of pages to be used as a motif for the print. 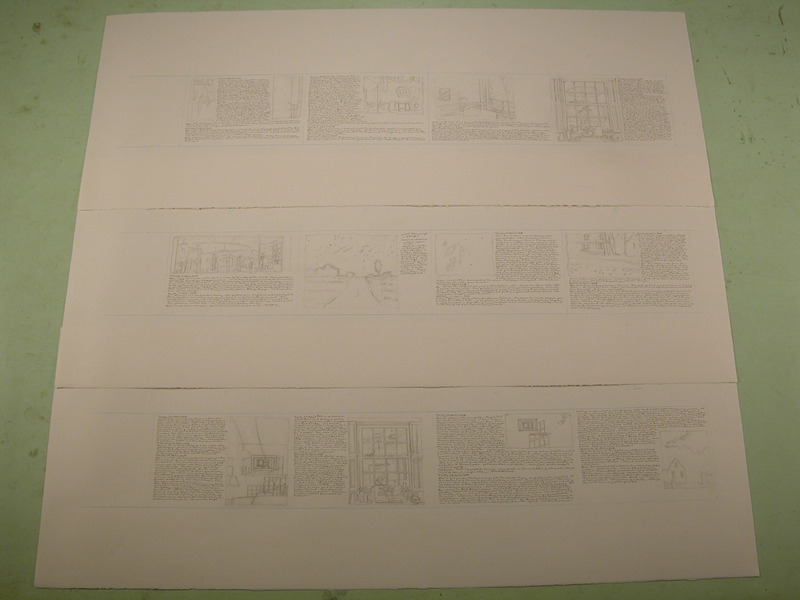 (middle) Two horizontal rows of photocopied images from journal 130 that will serve as the image base for the accordion fold print. (bottom) The folded half-size maquette features the sequence of images sketched in watercolor on Arches paper. An accident opened a path. I was cleaning the studio, making room for projects when a long strip of paper fell from beneath the cover of my drawing table. Two inches wide and forty inches long, it was a panoramic drawing on Arches paper I began in 1992. On the front were the bare outlines of a landscape I never completed. The back was unused white paper. Looking at the long format of the sheet, I instinctively knew that it would be my maquette for my accordion print. I had planned for the pages of the print to be the size and shape of my current journal pages: 4 inches high by 6 inches wide. By sheer coincidence, the paper I found was one half the height of my actual journal pages: 2 inches high. I began to fold the long strip of paper in the planned format. When I folded the whole 40-inch sheet, there were twelve panels and a half. The half page could be the title page for the project. I still had no subject. Rolling through the pages of my journal, I sought images, a place to start. The past month had been an intense one both emotionally and artistically. It dawned on me that I could revisit a section of my current journal. Counting the pages in the month of April there were seventeen. If I removed a few of the images, I could make the whole month of April fit on twelve pages. A majority of my written entries could also be included. After photocopying the pages from my journal that I wanted to include, I trimmed the photocopies to the 4 x 6″ page size and arranged them side by side in chronological, journal-entry order (see image above, 2 rows of middle panels). Next I took watercolor and did quick rough sketches on the long strip of paper to evoke the presence and flow of the folded object I was creating (see image above, bottom row). After talking to printer and artist Jim Stroud, my collaborator, I learned that the plates we use would only accomodate 4 panels set side to side. I laid out 3 new sheets of paper, each comprising 4 of the panels (see image below). I sketched out the outlines in pencil and inscribed my journal entries in pen and ink. These 3 pages will be passed to Jim who will have a photographic negative made that can transfered the images/texts to the printing plates. The outlines will serve as the armatures on which I will work various printing processes. I head to Center Street Studio to work this week. (above) Three sheets of 30″ wide paper each containing layouts for four of the pages to be included in the Accordion Fold Print. Written entries are inscribed in pen and ink. Drawings are in pencil. Each of the three sheets will be photographed and transfered to a printing plate as structures to be interpreted and expanded in a range of printmaking techniques.